So Chicago is already a huge cupcake city, which I know because I am trying to hit up all the bakeries there over a span of 2+ days in September. Now, thanks to the local blog Live Here Oak Park we've learned about two new exciting Chicago cupcake developments. Cupcakes have invaded every nook and cranny of the city over the last few years, and unfortunately Oak Park has been late to the party. Well, we'll be getting our very own a cupcake joint close by in the very near future with the arrival of the Cupcake Gallery at 5934 W. Lake Street in Chicago. I'm most intrigued by their flavor listing, which includes caramel and green apple (!! ), white chocolate raspberry, apple pie a la mode, honey lavender vanilla, green apple martini and an Arnold Palmer cupcake (lemonade cake with a sweet tea frosting) - and those are their premier flavors, they also have more traditional ones. 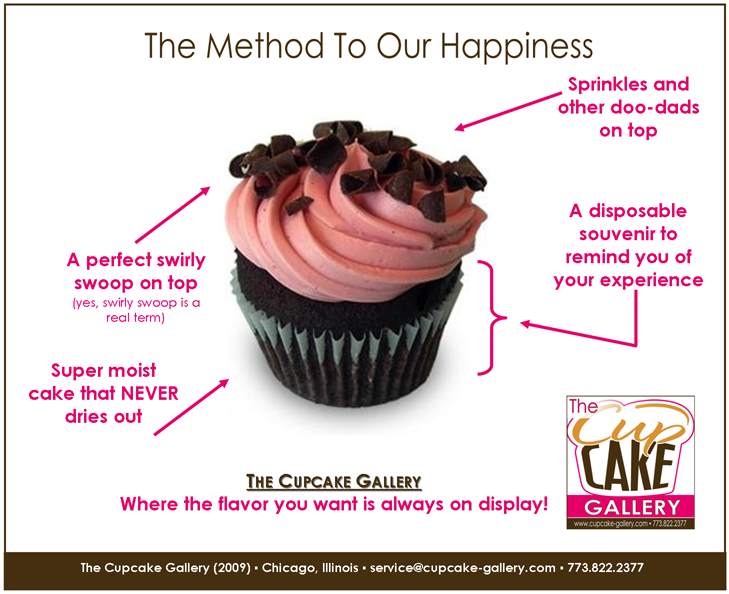 You can currently place orders for delivery on their website, and can reach them at 773-822-2377 or via email at service at cupcake-gallery.com. And as if the owners of The Bleeding Heart Bakery weren't busy enough creating a punk rock cupcake cookbook and doing a reality show and running kid-themed bakery Smash Cake, they're opening a second location! The folks at the bakery made their announcement on Twitter (@Bleeding_Heart) a few days ago and since then, I’ve had visions of tasty cupcakes dancing in my head. As a matter of fact, as I’m writing this blog post, I’m enjoying the cupcake topped with the rose petal pictured below and I can tell you it’s deliciously wonderful. For those of you who haven’t been to their Chicago location, you’ll quickly see The Bleeding Heart isn’t your typical bakery. As a matter of fact, their tagline says it all: Local – sustainable – punk rock pastry. And for a ‘burb, I’d say that Oak Park is pretty punk rock, so they should fit right in. Their bakery at 1955 West Belmont has a fun, funky feel that I hope they bring with them to the new shop. 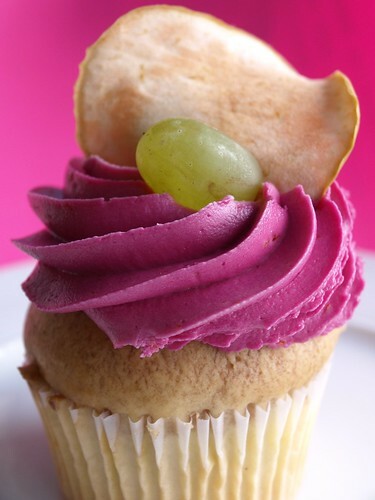 This is an oldie but goodie photo by The Bleeding Heart Bakery on Flickr of a sangria cupcake! Thanks for posting that photo. It is one of my favorites!